All roses produce Rose Hips. Rose Hips are actually the fruit of rose plants created after their flowers have been fertilized. Typically red or orange in color, Rose Hips have been found to offer amazing medicinal benefits. Used to treat many different ailments, they’re super high in Vitamin C and great for boosting your immune system! In our “Benefits of Rose Hips,” podcast and show notes below, we’ll briefly teach you about Rose Hips and explain some of their many health benefits. This episode is meant for beginning to intermediate gardeners looking to learn about the uses of Rose Hips. Check out our Rose Hip product links below! There are numerous benefits of Rose Hips. The health benefits of Rose Hips are endless! Rose Hips are the fruit that has been produced by rose plants. They end up looking like little red or orangish-colored balls, or seed pods, topping the ends of rose stems. All roses will produce Rose Hips, but the Rugosa Rose produces the best ones. Due to their high amounts of vitamin C, there are so many wonderful reasons to think about adding Rose Hips to your health cabinet. In this podcast, we’ll discuss several more of their health-related benefits. Rose Hip Oil, Rose Hip Tea, and More! Are you ready to try a product made with Rose Hips (after checking with your doctor, of course)? There are so many products out there incorporating Rose Hips, it shouldn’t be hard to find one that works for you. In addition to products, there are numerous recipes to choose from. Rose Hips can be used as an oil for your skin, your nails, and more! If used correctly, it can help prevent wrinkles, stretch marks, and moisturize, among other things. Another way to incorporate Rose Hips into your life would be to brew it as a tea. With its high concentrations of vitamins A and C, this tea can act as an immunity booster enhancing your overall immune system. Pick some up today so you are ready for the next cold or flu! Another way to add Rose Hips to your diet would be as a supplement or tablet. Always check with your doctor before adding this to your health regimen. You can use crushed up Rose hips, dried Rose hips and more in recipes for everything from tea to jams and jellies. The benefits of Rose Hips to your health are endless. With their potent punch of vitamin C and ability to boost immunity, they can both help lower blood pressure and alleviate back pain. Whether taken in tablet form, brewed in tea, used as an oil or in recipes, Rose hips belong in your diet. That’s all for this DIY garden minute episode! 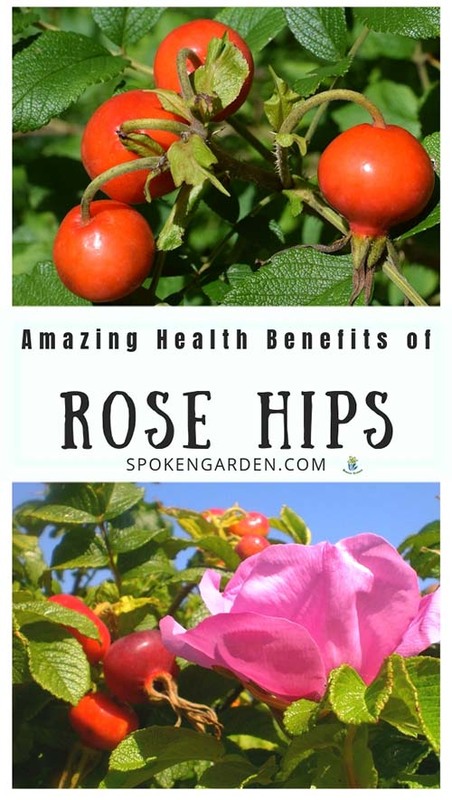 Click the graphic above to save “Benefits of Rose Hips” to Pinterest for later! Learn what Rose Hips are and how they are beneficial to your health. Brief definition of Rose Hips and where they come from. Examples of their beneficial uses.